Located in Barceloneta, this beachfront hotel is in the historical district, just steps from San Sebastian Beach and Barceloneta Beach. Port Vell and Barcelona Aquarium are also within 2 mi (3 km). Barceloneta Station is 21 minutes by foot and Jaume I Station is 29 minutes. 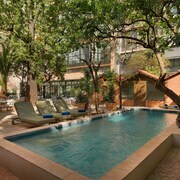 Located in Poblenou, this hotel is within 1 mi (2 km) of Bogatell Beach, Barcelona Zoo, and Diagonal Mar Shopping Mall. Barceloneta Beach and Picasso Museum are also within 2 mi (3 km). Llacuna Station is 5 minutes by foot and Poblenou Station is 7 minutes. 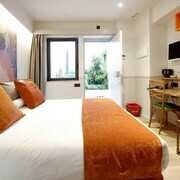 Located in Ciutat Vella, this hotel is within a 5-minute walk of Rambla del Raval, La Rambla, and Palau Guell. Boqueria Market and Gran Teatre del Liceu are also within 10 minutes. Liceu Station is 6 minutes by foot and Drassanes Station is 6 minutes. 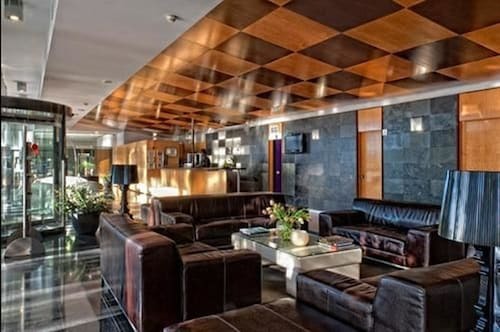 Situated near the airport, this hotel is 0.5 mi (0.8 km) from Fira Barcelona and within 3 mi (5 km) of Montjuic and Camp Nou. Casa Batllo and La Rambla are also within 6 mi (10 km). Europa - Fira Station is 15 minutes by foot and Ildefons Cerda Station is 17 minutes. 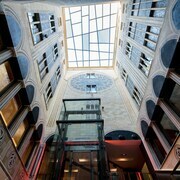 Located in Gothic Quarter, this hotel is steps from Teatre Principal, Centre d'Art Santa Monica, and Palau Guell. Barcelona Wax Museum and Placa Reial are also within 5 minutes. Drassanes Station is only a 2-minute walk and Liceu Station is 5 minutes. 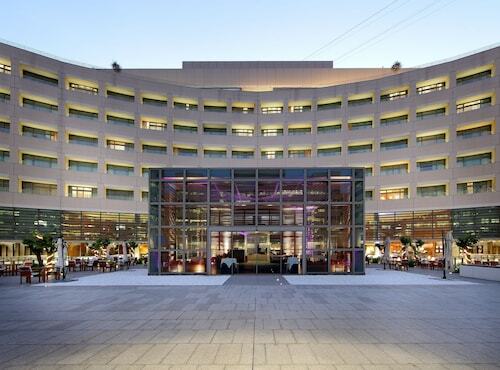 Hesperia Tower is located midway between Barcelona-El Prat Airport and the city center. The nearby Hospital de Bellvitge Metro Station is a 3-minute walk away, providing easy access to all of the city's main sights. Plaça de Catalunya is a 25-minute ride. 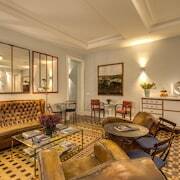 Located in Eixample, this luxury hotel is within a 5-minute walk of Passeig de Gracia, Casa Batllo, and Casa Mila. Placa de Catalunya and Rambla de Catalunya are also within 15 minutes. Diagonal Station is only a 5-minute walk and Passeig de Gracia Station is 7 minutes. 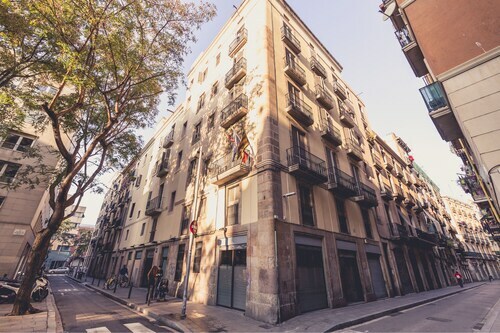 Located in Gothic Quarter, this luxury hotel is within a 10-minute walk of Basilica de Santa Maria del Mar, La Rambla, and Barcelona Cathedral. Port Vell and Picasso Museum are also within 10 minutes. Jaume I Station is only a 5-minute walk and Barceloneta Station is 9 minutes. 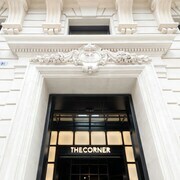 Located in Gracia, this luxury hotel is within a 10-minute walk of Passeig de Gracia, Casa Mila, and Rambla de Catalunya. Casa Batllo and Placa de Catalunya are also within 1 mi (2 km). Diagonal Station is only a 4-minute walk and Gracia Station is 8 minutes. How Much is a Hotel Room in Barcelona? 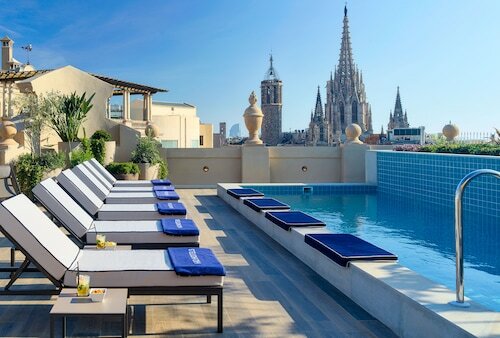 Hotels in Barcelona start at C$96 per night. Prices and availability subject to change. Additional terms may apply. Welcome, traveler, to the “City of Counts.” Your dreams of Catalonian cuisine, long siestas in the sun, and music-filled nights are ready to be fulfilled here, in Spain’s second-largest city. When you first set foot on its winding, tree-lined streets, you’ll feel the distinctive sense of history this place is imbued with. Humans have lived here for thousands of years—though the first recorded settlements came in the Roman era—and they’ve passed their stories down through the centuries, wedding Barcelona’s rich past to its bright future. Do you feel the urge to craft your own tale? 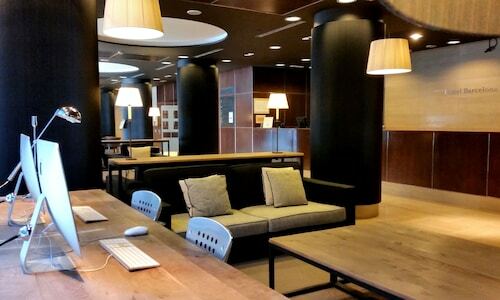 When you book one of Travelocity’s Barcelona hotels, you can do just that. Hotel 1898: Forget your cares and indulge in the truly spectacular. Take in the city skyline while devouring a remarkable meal at La Isabela Terrace, the hotel’s rooftop restaurant, then let your body relax as you dive beneath the high thread count sheets of your spacious room. 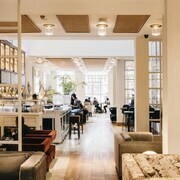 Further treat your limbs with a visit to the spa: tucked away from the world in a red brick and stone haven, you’ll feel a world away from the bustling city. Treat yourself to a pearl dust wrap or simply float in the pool: With your eyes closed and the only sound the gentle trickle of water, you may well drift off to some other, more magical realm. 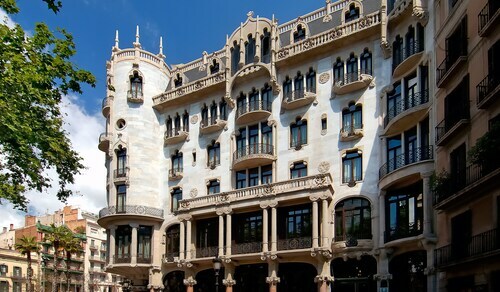 Majestic Hotel & Spa Barcelona: Give yourself over to Old World elegance and excellent service. You’ll feel like the king or queen of the city when you gaze out over the skyline from your comfortable room or spacious suite. In continuous operation since 1918, this hotel possesses an extravagant, commanding allure, and willingly indulges you in lavish spa treatments and exquisite meals served in its on-site restaurants and bars. No morning is complete without the Majestic Breakfast Experience, a remarkable buffet devised to satisfy even the trickiest palate. Enjoy a variety of foods from every corner of the earth as the sun sparkles overhead: Ahh, this is what life is truly about. 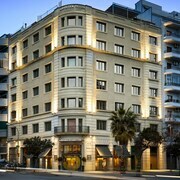 Olivia Balmes Hotel: Tasteful, stylish décor is the hallmark of 128 rooms at the Olivia Balmes. 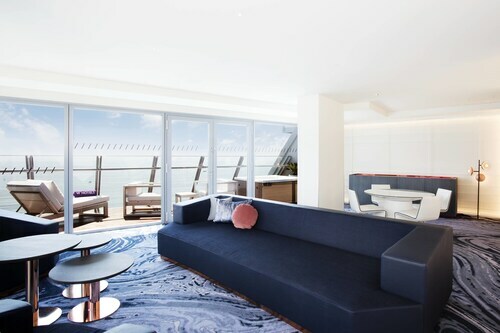 Choose your space based on your requirements; you may find that a standard room suits you, or perhaps you wish to relax in the giant, modern suite. 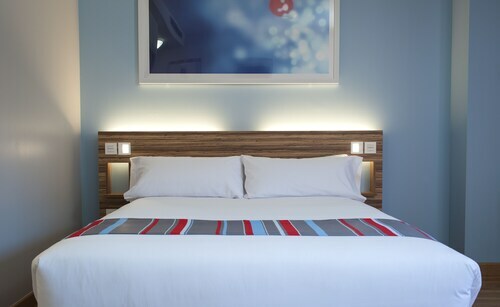 Watch a movie in the evening as you recline on your comfortable bed, or spend your nights at Seventeen Restaurant, where you can indulge in Mediterranean-inspired meals that vary by season. W Barcelona: Oceanfront rooms offer a commanding view of the Balearic. Imagine sitting down in a comfortable chair, your favorite book in hand, and losing yourself in the turquoise seas awaiting just beyond the clear glass panes. After you’ve satiated your spirit in peace and quiet, sprawl out in the lounge with a glass of Champagne, greeting fellow travelers and trading stories of adventures past. Your adventure, though, is just beginning when you book hotels in Barcelona through Travelocity. 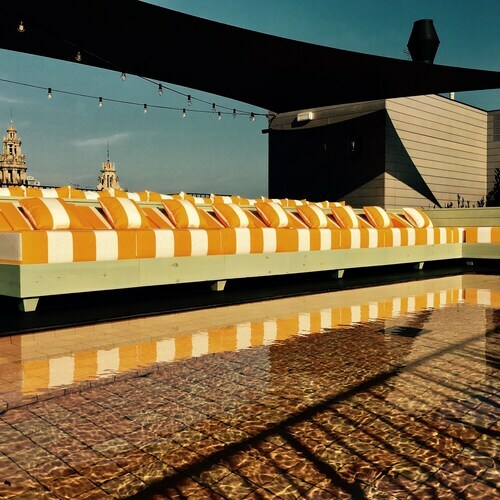 Whether you’re seeking five-star accommodations fit for a king in the heart of the city, or simply seek cheap hotels near Barcelona’s outer limits, we’re here to ensure you find the perfect place to stay. Book today, traveler, and spin more stories tomorrow. It.s close to everything you would like to see. There’s lots of restaurants and cafe’s nearby. About less than minutes walk to Las Ramblas,, Columbus circle and the beach. The surrounding is quieter than it it is in the Las ramblas district. This hotel is very nice. I will stay here again. Transportation Loved the fact that it was close to the airport and had a regular airport shuttle from airport to hotel up till 1a.m Also , a bus and metro not to far to get into the city centre also. The location is great and the staff is very helpful. Great location. Friendly and informative front desk staff. Great location and nice rooms. Right next to LA Rambla and had view of cruise ships from the balcony.